Osmosis: Hedgehog signaling pathway. (2019, April 24). Retrieved from (https://www.osmosis.org/learn/Hedgehog_signaling_pathway). The sonic hedgehog protein plays a large part in signalling events of the development of the embryo. It is involved in processes including vasculature development, left-right axis development, neural patterning, and almost every other embryological development. 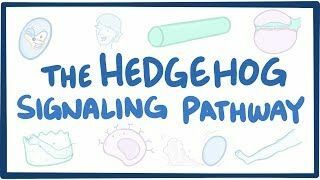 The sonic hedgehog pathway is active in many different genes, and is regulated by enhancer elements that regulate the transcription of sonic hedgehog protein in different tissues. Before sonic hedgehog proteins bind, patched receptors (promote/inhibit) differentiation of the embryonic cell.